Comments: The eastern screech-owl is one of our smallest owls. It occurs in two colors. The majority are gray but about 7 percent of the birds are red. Both males and females may be either color. The call of a screech-owl is not a screech but a soft, mournful, descending whinny. They are very secretive and commonly live in urban yards without the owner’s knowledge. They spend their days in tree cavities or perched in dense vegetation. When tree cavities are not available for nesting they will readily use a manmade nest box. 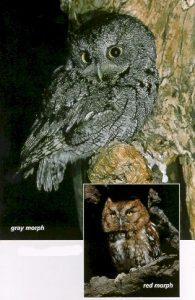 Distribution: The eastern screech-owl is found from eastern Colorado to the Atlantic coast. It is common in wooded habitats of eastern Kansas. In the plains of western Kansas it is restricted to the wooded areas along streams and in towns. Food: Prey items include rodents, small birds and insects. Occasionally fish, snakes, lizards, frogs, toads and crayfish are eaten.